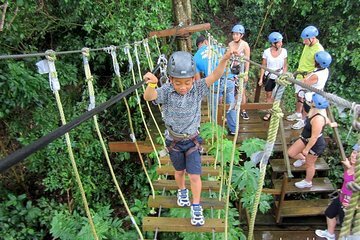 Visit Roatan's number one fun park for zipline rides, beaches and monkey park. Kevin G was our driver/tour guide. Kevin was professional, informative and fun. 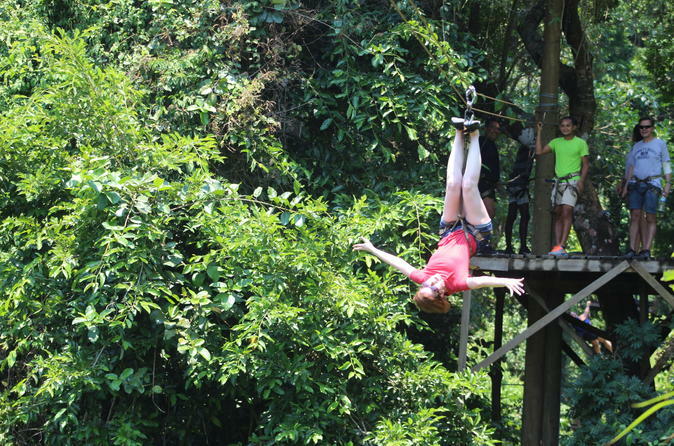 The Zip Line and Monkey tour are amazing!!!!! we elected no to go to the beach after Zip Line. Kevin drove us to several shopping areas and a few places to take a some amazing pictures. The three of us had a FANTASTIC time, Thank You Kevin G and Henry Tours. We booked our day trip in Roatan (we were there from a cruise ship) and this was awesome. The zip line course was 16 separate lines and the greatest part is it is Freestyle ziplining, meaning you can do flips, zip upside down etc). We had two guides, Andy and July, that zipped with us (one in front and one in back) and a photographer that took a great set of pictures which we purchased. The monkey park was great too. We were allowed in the cages and could feed and hold the monkeys and the young man who guided us through the park was informed about the animals. After our time at the ziplines and the monkey park, our driver took us to the beaches near the Paradise Beach Hotel in West Bay. We were able to get beach chairs and enjoy some great food/drinks before being driven back to the port to board our ship. The only feedback I would give regarding transparency is that in order to use the beach chairs at the Paradise Beach Hotel we had to pay $20 US per person. Well worth it but would have liked to have known when booking. Our family had a wonderful day at the Zipline and Monkey Park. Our guides, Trent and Brent, met us right at the planned location and we headed to the zipline park. Our zipline guides were fun, ensured our safety, very helpful and kind. Our children, ages 8 and 12, loved the ziplines and were flipping upside down and doing tricks on the first run. There was a 5 year old in our group and he did great, too. The monkey, sloth and bird sanctuary was small but a perfect end to the zipline adventure. We chose to skip the beach and head back to our cruise ship at the port and explore around there. We would highly recommend this excursion. Peter and Jemsion were are guides for the zipline, they did an amazing job making sure we had fun and was safe during our whole session. The monkey park was a great experience as well. We got to hold the parrots and the monkeys were very friendly. Great excursion to pick. We had the option to choose a public or private beach we chose a private beach it was very nice just the sand was not as soft as I would have liked it to be, but the music was good and they had wifi for $3. This was a great time! Shorn drove us to the site, they fitted us up and I was able to leave some things in a locker and take the key. After zip lining so fun! the guys who took us up obviously enjoy what they do!, he drove us to the public beach, which was amazing. The drive was rather long because of the pot holes in the pavement, but once we got there, we were able to grab a couple of beers at the bar and listen to some music. He was very informative about the area and easy to talk to. Highly recommend! This was by far the best part of our cruise! Rafael, Quinn, and Alex made it so much fun it was unreal. They encouraged us to let loose, and I went mostly upside down, which was terrifying, yet exhilarating. My 7 and 9 year olds LOVED it. Be sure and spend the 25 for the photo dvd. One of them took photos, and they are amazing! I wondered about safety, but you are strapped in so tight, you aren't going anywhere! The monkey park is a bit misleading. Just some animals in cages out back. But we all held them and got some great pictures! I can't speak for the beach - the kids were tired and hungry, so we skipped it. First off, the zip lines were wonderful. The pickup location was about a 1 mile walk from the ship. We saw the sign immediately and were taken by a private car to the zip line location. Our guides: Preston and Marcos were great. Here's the problem. My husband and I are over 65 and out of shape. The first platform is up such a steep incline that ropes were provided to help you climb up. Our poor guides actually were pushing our backsides to help get us up there and when I reached the top I was so winded that I had to rest for about 10 minutes to catch my breath. Then the fun began. A cameraman took tons of photos and when we were done with the zip line portion he asked for 30, we paid 20. Over 100 pictures. I'm not sure it was over 20 platforms, I didn't count...but loads of fun. At the end of the zip lines we saw the monkeys who were in cages as were the parrots. Yes they took some out for us to hold and take photos with, but all in all, pretty lame. We didn't want to go to the beach so the driver took us on an island tour for no additional charge. The roads are the worst on any island we've been on. DON'T BOTHER! At the far end of the island is a resort with lots of bars and gift shops. Other than that, nothing to see or do. In our opinion, just a waste of an hour at least. All in all it was something that we will always remember, but please be forewarned about the level of stress to get to the first platform. Also, beware of the red ants and wear closed shoes. Had a wonderful excursion off Carnival cruise ship. Guide was where they said they would be only negative was it is a pretty long walk from terminal up and down a steep hill. driver was friendly, informative and very helpful. Zip lining was a blast 4 different guides helping, 17 zippiness, some very long. My 82 yr. old mother did this for the 1st time and they took great care of her and she loved it. Monkey and bird park is right on premises kind of small but monkeys were cute and playful and we weren't rushed at all. Would highly recommend this trip. When they take you back to ship, they are able to pull up much closer to terminal. Looks sketchy as heck, but it was amazing! You have your own driver for the day which was excellent. Only issue is you have to pay extra for the beach though. Very good guides and fun!